"I orchestrate my mornings to the tune of coffee and If you want instant coffee, you’ll have to wait." 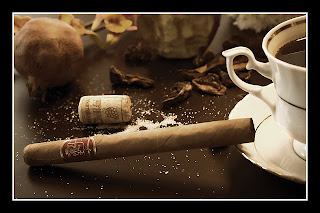 Coffee is highly complimentary to fine cigars with flavors of Vanilla, mocha, chocolate, and roasted notes, nuttiness, and earth, can all be found in both cigars and coffee. *This Leon Jimenes cigar is Made in the La Aurora factory in the Dominican Republic, the country's oldest factory. A well-made Dominican cigar brand blended with the highest grade USA Connecticut Shade wrappers and Dominican fillers. Brand owned by the Miranda family Since 1987.